"Do you fancy a day out in January" asked Steve, during a lull in the excitement of the "Away from the turkey" trip in December. Apparently, Rail Magazine, through their "Readers' Loyalty Card" were running a two for the price of one offer in January, using "Savers" and "Super Savers" on Virgin trains. "Why not - where shall we go?" The next question was "when?" - in the event, it was the last possible day which proved to be the first that suited us both. So, we duly presented ourselves at Wolverhampton for the 0734 HST service to Bournemouth, originating from Manchester Piccadilly, which we would travel on to Southampton, for the sum of £20 each. Without seeming to hurry, we arrived at New Street at 0752. ("Two minutes early" said Steve, consulting the timetable). Soon we were away again, shortly passing the boarded-up Curzon St. box. The low level line to Vauxhall, scene of some fun and games on a "Branch Line" trip a few years ago, had gone. We followed the usual route via Coventry. Over 25 years ago, as students in Birmingham, my wife - then girlfriend - and I booked for a day excursion to Reading, where her parents then lived. Formed of a rake of DMUs, this trip ran out via Nuneaton and Coventry before joining its natural route at Leamington. I counted myself fortunate to traverse two freight-only lines - now of course both carry passengers again. (The aforementioned young lady grinned indulgently - she already knew what to expect). Two foxes sitting in field watched the train's progress through the north Oxfordshire countryside as we approached Banbury. The once extensive sidings at Banbury seem to have given way - mostly gone to new housing "Makes a change from supermarkets". We were held briefly outside Oxford, giving us a chance to survey the class 165 Turbos outside station, and the rails still in place on swing bridge over the canal, just outside the station. We stood several minutes outside Didcot, giving us a chance to study 47476 Night Mail in red RES livery, not to mention the assorted paraphernalia of the GW Society. We could not however quite make out Mr. Massey's tripod leg marks. 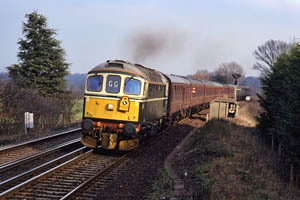 37 892 "Ripple Lane" was engaged in permanent way work at Tilehurst, where the up slow had been taken out, the cut-up track panels resting on a rake of flat wagons. 3 rail-mounted JCBs (are they spottable?) completed the scene. Back in October we had seen departmental RH 97654 at Slateford, Edinburgh. Our train stopped for a couple of minutes outside Reading station, conveniently alongside its derelict, partially dismantled brother 97653. 08 904. We should have left Reading at 10 o'clock; it was actually 9 minutes past before we were under way, heading out past the numerous "turbo" DMUs at the depot. We only seemed to amble along the former GWR route to Basingstoke. There must however be some recovery time in the latter stretch - we arrived at, and departed from Basingstoke on time. In the minute during which we stood at the platform, a class 442 unit arrived, bearing the name "Mary Rose" "Not a good name" commented Steve "I’m not sure I'd like to travel on that one". Apparently, some years ago, Steve and another crony has devised the BR "Disaster" class, the members of which could bear such names as "Tay Bridge", "Titanic" etc. We spent a happy minute or thinking up one or two (possibly unmentionable, given the laws of libel) new members. Many wagons stood in the yard before Eastleigh station; a number of classes 33, 37 and 73 stood in the works sidings. A "Virgin" train passed in the opposite direction - "Porterbrook 47" commented my companion, though I don’t think he got the number. Finally, after a pause at Southampton Airport, we arrived at Southampton Central, still on time at 1103. We had debated our itinerary for the day whilst on the train - a run to Lymington seemed a reasonable idea. "Let’s get a few shots from the footbridge, then catch the 1141 Weymouth train". There seemed to be a few gricers about - the reason, we discovered on the footbridge, was that a special was due in, double headed by "Black 5" no. 44767 "George Stevenson" and D6593. The steamer was due to come off at Southampton; the special then going forward to Poole behind the preserved 33. However, it was reported running quite late, and we decided to stick to plan "A" and head for Lymington. Typically, a 47 passed through on freight as we bought our tickets. The Weymouth train was formed of 2 cl.442 units - my first trip with these units. As we headed out past the rusty rail entrance to Western Docks, the sun began to break through "We can get out at Brockenhurst" (the junction for the Lymington Branch) "and get a few shots before we go down the branch. We might see the special". We did too - after one or two electrics, and a northbound HST, it hurried through, the 33 bustling along nicely with the 9-coach train of maroon MkIs and green (!) Mk IIs. We now joined the EMU forming the 1300 to Lymington Pier. "If it's a minute late, it will be 1301 departing 1301" commented Mr. Price, on noting the unit number. It left on time. A pleasant run down the branch took us to the pier by 1310, just time for a quick snap then back to Lymington Town. A short walk took us to the harbour side, for a few shots of the next working down to the pier and back, then lunch - ham, egg & chips, washed down with Wadworth's, before rejoining 1301 for the 1445 back to Brockenhurst, to catch the 1500 back to Southampton Central. We took up position for the return of the special above the tunnel at the north end of the station. At about 1540, sulphurous smoke began to issue from the tunnel mouth, along with a familiar hissing sound. An EMU left the station for the north, and 44767 then backed out of the tunnel and into platform 1. Bang on time at 1550, the special pulled up behind it, and coupled up, and the train was away on time at 1605, with some very nice steam and smoke effects, and just enough light remaining to record it on film. There was just time now for a coffee and something to read on the train - it would be dark most of the way home. Our train, the 1649 to Manchester Piccadilly via Stoke, the "Pines Express" left on time. In fact it kept time to the minute all the way home. At Reading, a number of football supporters joined the train - Birmingham City had been playing there - and we wondered for a while if we were going to have a noisy journey, but in fact they mostly (but see below...) kept themselves to themselves. The train had filled up quite a bit, and on leaving Oxford at 1822 we were practically full. We began to thin out again at Leamington, and more left at Coventry and Birmingham International. Soon we were making the usual slow approach to New Street, at which point there was a general hubbub in the next coach, followed by the door opening and a "Conga" of "Blues" supporters danced through, returning a few moments later. The joyous football songs ("Trevor Francis Walks on water" to tune of "deck the halls with boughs of holly") ended with, in that happy way which seems to epitomise the Brummy, "we lost 2-nil but the Blues are going up". All good natured and friendly! So we arrived finally at Wolverhampton easily on schedule - the train was just leaving, on time, at 2013, as we regained the car in the car park. It had been an excellent day out. Steve mentioned another offer for March - anywhere you like on Virgin trains for £25, with "a friend" travelling at the same price. Watch this space!